AT LAST Canal & River Trust has decided to install pumps to bypass the breach on the Middlewich Branch. This now allows water to be pumped past the breach and into the Trent & Mersey Canal, that with so many closures is the only 'uninterrupted' route in the area and so is seeing more boats than normal, Keith Gudgin tells us. 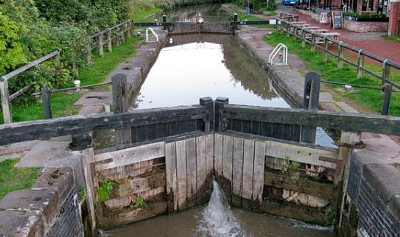 The pumping of course allows the restrictions on the Middlewich locks to be lifted, that was placed on Booth Lane Top Lock to Big Lock (pictured) due to low reservoir water level. The pumps came into operation yesterday, Thursday, and will continue to operate whilst their is a water shortage in the Trent & Mersey or until the breach is eventually repaired.